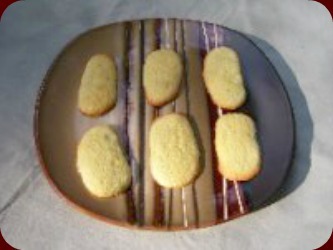 Ladyfingers Recipe is an easy to make delicious, dainty cookie that is sometimes also called little cakes. The mixture produces a soft light sponge cake type batter rather than a dough as most cookies do. However, the batter produces a spongy cookie that can be eaten as is, or used in making other desserts such as Tiramisus, mousse cakes, and trifles. They make a great substitution for vanilla wafers in banana puddings and other desserts. They also team well with ice cream of any flavor for a quick dessert. Have all ingredients at room temperature before mixing. This temperature helps the eggs to incorporate more air as they are beaten. Add egg whites and cream of tarter to mixing bowl. Beat on high speed until soft peaks form. Beat in half of the sugar, a little at a time, until peaks are stiff but not dry. Place in another bowl and set aside. Add eggs and lemon juice to the mixing bowl and beat on high speed until thick. Beat in vanilla and almond flavorings and salt about 1 minute. Gently fold in flour, a little at a time lifting and stirring by hand until smooth. Do not mix with electric mixer after starting to add the flour. It will cause important air bubbles to dissipate preventing some rising of the dough. Carefully fold in the beaten egg to the yolk mixture. Place batter in a pastry bag with a 1/2 inch tip. I use a Ziploc plastic bag (gallon size). Cut a 1/2 inch hole in the corner of the bag to pipe batter through. Place parchment paper on cookie sheet and spray with vegetable oil or grease with butter. Pipe batter onto paper in strips 3-4 1/2 inch long and 1 inch wide. Unless I am going to use this Ladyfingers Recipe for a special dessert as mentioned above, I make them about 3 inches long as you can see in the image. These cookies are so light and tender, the longer size has a tendency to break in half easy through handling. Dust or sprinkle lightly with powdered sugar. Bake in a preheated oven 350F. for 12-15 minutes until lightly browned. Remove from oven and lift cookies from parchment paper with a metal spatula onto a cooling rack. If you want the bottoms smooth, cover the cooling rack with a smooth (not terry) kitchen cloth. You may sprinkle more powdered sugar on the tops while they are warm or roll the entire cookie in powdered sugar if you prefer. Serve hot or cold. Cookies can be frozen. These homemade cookies are so much fun to make! Almond Cookies Reduce vanilla extract to 1/2 teaspoon and increase almond flavoring to 3/4 teaspoon. Sprinkle finely chopped slivered almonds on top before baking. Lemon Cookies Omit vanilla and almond flavorings and add 1 1/2 teaspoon lemon flavoring and 1/2 teaspoon lemon zest. Strawberry or Raspberry Sandwich bottoms of 2 cookies together with a teaspoon of Strawberry or Raspberry Jam.